*In 2012, a basketball receptionist “completed coursework” for a player who had been deemed academically ineligible. When evidence of this incident became known to Syracuse’s Director of Basketball Activities, whose primary role was in overseeing the academic lives of players, he failed to report the incident and allowed the receptionist to continue working with student on the coursework. *Syracuse reportedly followed an “unwritten rules” policy on banned substances, and failed to make players sit out basketball activities after testing positive for banned substances. As a result of the violations — many of which were initially self-reported by Syracuse – the NCAA has put the school’s athletic program on probation for five years. 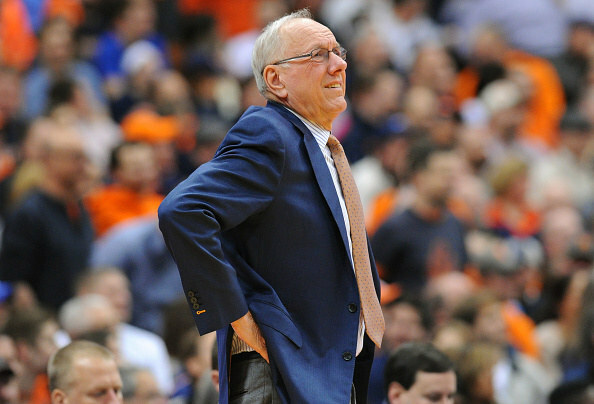 Men’s basketball coach Jim Boeheim has also been suspended for nine conference games. They will also “vacate all wins in which ineligible men’s basketball students played in 2004-05, 2005-06, 2006-07, 2010-11 and 2011-12 and ineligible football students played in 2004-05, 2005-06 and 2006-07.” The full report does not specify the number of wins, but Syracuse said it is about 108. In addition to vacated wins, the school will be fined $500 for each game in which an “ineligible student” was found to have participated. Again, the report does not specify the number of games or total amount. The school will lose three athletic scholarships per year for the next four seasons. Vacation of 24 men’s basketball wins (15 in 2004-05 and 9 in 2011-12); and Vacation of 11 football wins: (6 in 2004-05; 1 in 2005-06; 4 in 2006-07). Syvereud’s letter goes on to address each violation individually. Read the full letter here.